You can import this watchlist, “September 2016” directly into your Stock Rover account via the Library (instructions are here). Not all of them are priced for a “buy” at the moment, but we think all of them are at least worth watching, for reasons this article will go into. Consider this the first round of research, as we have not done a comprehensive deep dive on each of these six stocks. Always do your own research to your satisfaction on any company before investing your hard-earned cash. And with that disclaimer out of the way, let’s get into it, starting with the small caps and moving up in size. After slow growth that was below the industry average for the 3- and 5-year periods, ETH’s sales picked up in the last year, while the industry as a whole had negative sales growth. In addition to this quantitative evidence that the company is well run, it’s got some enticing growth prospects, including a collaboration with Disney (DIS) due out on November 18, the anniversary of Mickey Mouse, as well as 5-year blanket purchase agreement with the Department of State for a maximum of $300M or about $60M per year. 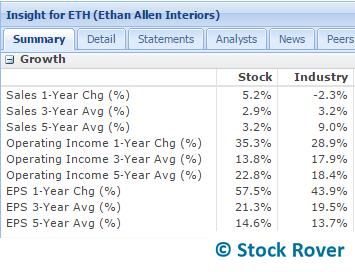 That sum is likely to be shared with other furniture companies but still has the potential to add significantly to ETH’s revenue, plus the agreement gives a vote of confidence to Ethan Allen products. From a valuation perspective, ETH is looking fair. It is trading at 16.6 times earnings, which is lower than its industry and in the low to middle range of its 5-year P/E range. Its price/book and price/sales are 2.4 (lower than industry) and 1.2 (slightly higher than industry) respectively, and its PEG forward is 1.0. Finally, ETH has a dividend yield of 2.1%, which is somewhat unusual for a small cap. EXLService (EXLS) is a business services company that provides operations management, outsourcing, and analytics to firms in banking, healthcare, insurance, and other industries. What caught our eye was its accelerating earnings and sales growth alongside excellent financial health. EXLS receives an A from Morningstar for financial health. It has a low debt/equity ratio (0.1), high interest coverage ratio (84.1), and increasing cash and free cash flow trends. Profitability seems generally in line with the industry. 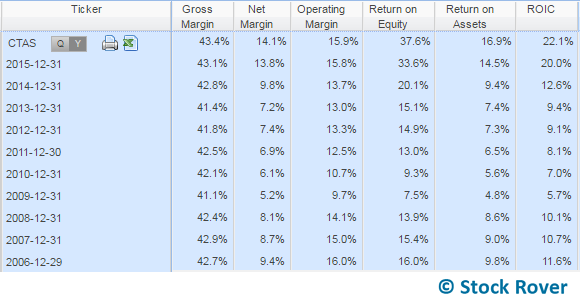 Its gross margin is tied with the industry average at 35.6%, its operating margin is a notch lower than average (10.7% to the industry’s 11.9%) and its net margin is higher (9.0% to 5.9%). These margins have generally floated in the same range for the past 5 years or so, although they have come down slightly from past levels. In the most recent earnings call, CEO Rohit Kapoor argues that the annuity nature of EXLS’s contracts and the strong demand environment will help protect them through the macroeconomic uncertainty caused by Brexit and global economic sluggishness. In fact, the sluggishness plays to their favor, as businesses seek to become more efficient. Furthermore, EXL’s technological savvy and data insights make them very relevant given increasing reliance on data analytics in business decisions. That is, assuming they do quality work that keeps their clients coming back. Based on their awards, this seems like a fair assumption on its surface. 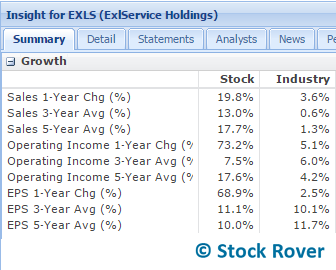 At 28.6 times earnings, EXLS is a bit pricey, although it has come down from the mid-40s in the last year, and its forward P/E is a more palatable 19.0. Minnesota-based Toro (TTC) makes turf maintenance, landscaping, and construction equipment. The stock offers a mix of earnings growth, good profitability, modest dividend growth, and solid financial health. Its main strategy for growing revenue appears to be inorganic growth, via acquisitions, joint ventures, and partnerships. Toro has already acquired several other companies that maintain their distinct brand identities, BOSS Snowplow being the most recent example. Below is a chart of sales (blue) and EPS (orange), with dotted lines charting their respective estimates for the next year. 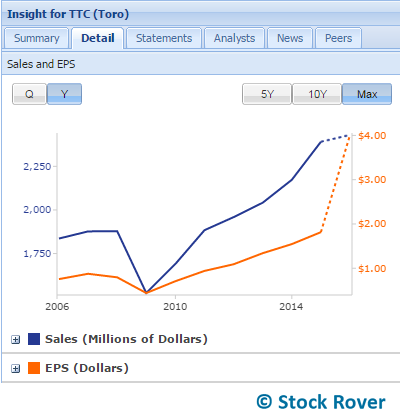 The tools and accessories industry as a whole is growing at a good clip as well, and Toro generally compares favorably, either matching or coming out ahead in most (but not all) growth metrics. Toro gets an A from Morningstar for financial health. Although it has a sizeable debt/equity ratio of 0.6, this has come down in the last two years while free cash flow is positive and has increased. 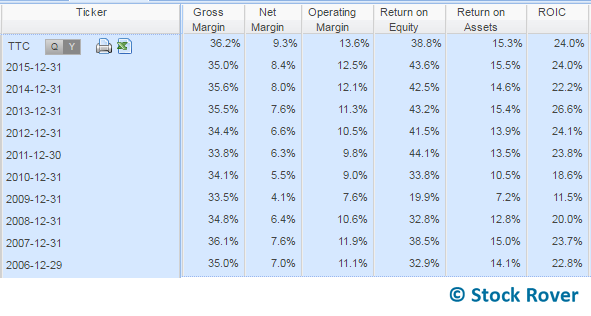 Gross margin, net margin, and operating margin have all come up since 2009. In particular it’s nice to see the steadily climbing net margin and operating margin, which speaks well of management’s ability to extract profit from revenue. 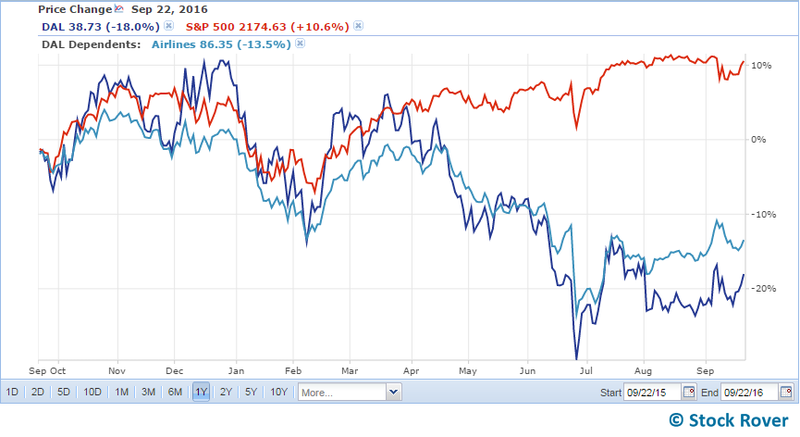 ROE, ROA, and ROIC have all bounced back heartily from 2009 as well. Less nice is TTC’s price, which is 23.8 times earnings right now and at a 5-year P/E high. If you want to put a more optimistic spin on valuation, look to its forward P/E multiple, 10.5, and its EV/EBITDA of 8.1, which is below the median for the S&P 500 and the second lowest in this group. Solid growth is predicted for next year as well. GNTX has managed to grow while taking on very little debt. It acquired some long term debt in 2013 but has has worked that down each year, and its debt/equity currently stands 0.1. This plus its increasing free cash flow has helped earn it an A from Morningstar in financial health. Meanwhile, it only gets a C for profitability, but that seems surprising to us given its industry-beating margins and increasing ROIC. 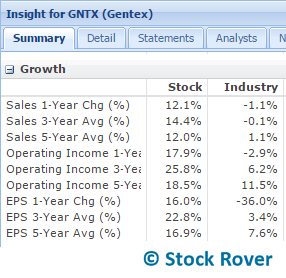 GNTX is also a dividend payer, with a modest current yield of 2.0%. Its history of growing its dividend while lowering its payout ratio suggests that the company is both attending to its shareholders and managing its finances well. A deeper look into qualitative data would shine more light on risks and vulnerabilities, but from a quantitative perspective, GNTX gives us much to like. Price-wise, it appears to be in a fair range. It has a P/E of 15.5 (which is in the lower end of its 5-year range), a forward P/E of 13.5, a PEG trailing of 0.9, and a PEG forward of 1.4. Its P/S and P/B are both above industry averages, but, like the P/E, they have come down from a few years ago. Cintas (CTAS) is a business services company with three segments: rental uniforms and ancillary products, uniform direct sales, and fire safety services. The stock has been riding a strong wave of momentum lately, which has resulted in an elevated valuation, near a 5-year high. So it may not be the best time to get in, but we think the company is worth watching for its solid fundamentals. These include good growth, strong profitability, sound financial health, and the possibility of dividend growth. CTAS is an industry leader that has bolstered its position with acquisitions. In fact, what led us to look more closely at CTAS in the first place was finding an attractive small cap, G & K Services (GK), which we discovered has just been acquired by CTAS. 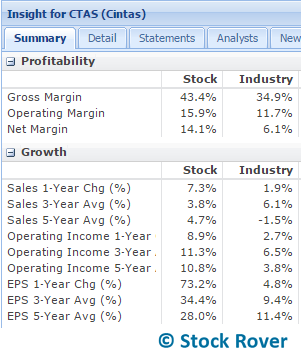 You can see its profitability and sales, operating income, and EPS growth compared with industry averages below. Its top line growth has improved in the last year, and has translated to stellar bottom line growth. As for profitability, it has a clear edge over its industry, and for further color we can see how it has improved in a variety of profitability metrics over the last 10 years below. The rise in net margin, return on assets, and return on invested capital are of particular note. Alas, as mentioned earlier, all this good stuff is already priced into the stock, making it expensive by most metrics. 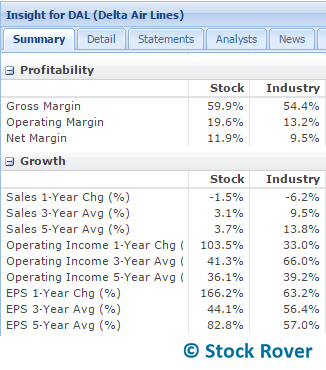 It has a 28.1 P/E multiple, a 24.2 forward P/E, a 1.0 PEG trailing, and a 2.4 PEG forward. Some relief is found in the fact that some of its multiples are lower than industry averages. Ouch. And DAL in dark blue has underperformed its industry by 4.6% in this period. Of course, a cheap price does not a good value make. Here is a little bit about why we like DAL’s fundamentals. For one, it has good profitability, scoring an A in this category from Morningstar. 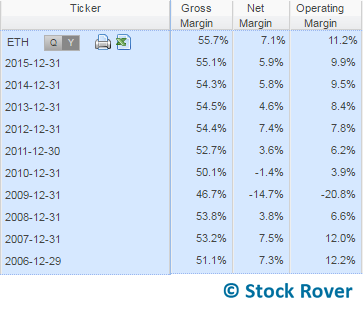 Its margins are in the double digits, beat industry averages (see image below), and have followed an overall increasing trend. From a financial health perspective, Delta has a number of positives. Although it has a goodly amount of debt, with a debt/equity of 0.7, this has come down from 1.0 in 2013. Its interest coverage ratio is a strong 23.1, and its free cash flow has been positive since 2009 and has followed a strong rising trend since 2012. DAL started paying dividends in 2013, and has increased the dividend per share year over year since then. The current yield is 2.1%. Its payout ratio remains extremely low at 8.7%, with a FCF payout ratio of 14.3%. This means there is plenty of headroom for dividend growth. One negative we discovered in our scan is that analysts have revised their earnings estimates downward for the coming year. This could mean that DAL’s stock is not out of the woods in the short term. A deeper look at qualitative factors is necessary, but the management team appears to be smart and proactive, which will allow them to adapt to the industry over the long term. This Marketplace podcast interview provides some good insight into Delta CEO Ed Bastian’s personality and long-game mentality. Sink your teeth into these stocks by importing the September 2016 watchlist into your account from our Library. For fun, we even threw a bonus stock into the watchlist. Go check it out!